The Human Randomizer is Coming To Get You! 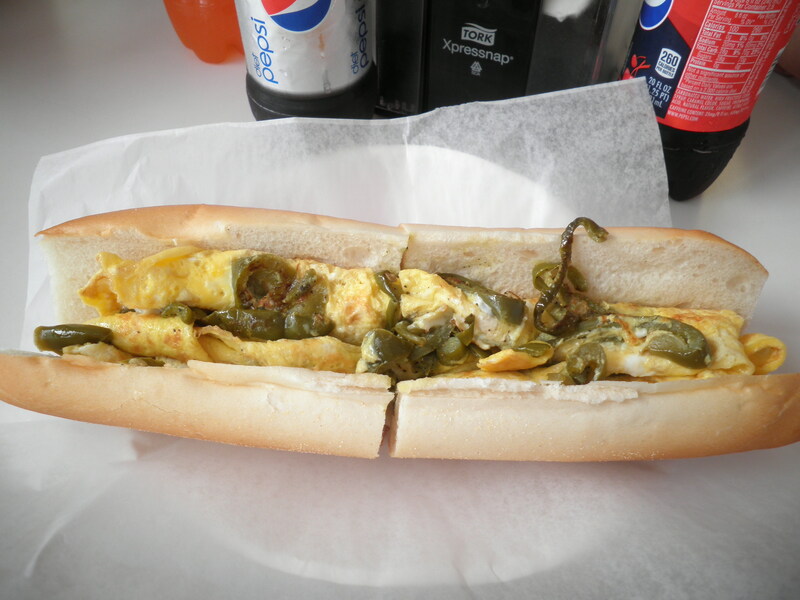 I love the fact that I got so many comments about the pepper and egg sandwich I showed as part of What I Ate Wednesday. If it looks delicious to you, trust me…it IS delicious. It brings back such memories to me and my sister, Ele. When we were kids, Mom and Dad would take us to Wildwood in the summer…duh of course in the Summer…no fun for kids there in the Winter! Mom’s take along sandwich of choice was homemade pepper and egg sandwiches. I think she would put American cheese on them but I’m sure they would be on white bread and wrapped in aluminum foil. By the time we got to eat them they were soggy and drippy and just wonderful. That’s why I love these sandwiches so much and order them when ever I can. Glad so many of you agree that they look yummy! It’s like eating a piece of my childhood! I’ve been working hard to stay on track with Weight Watchers this week. I think I’m doing pretty well. 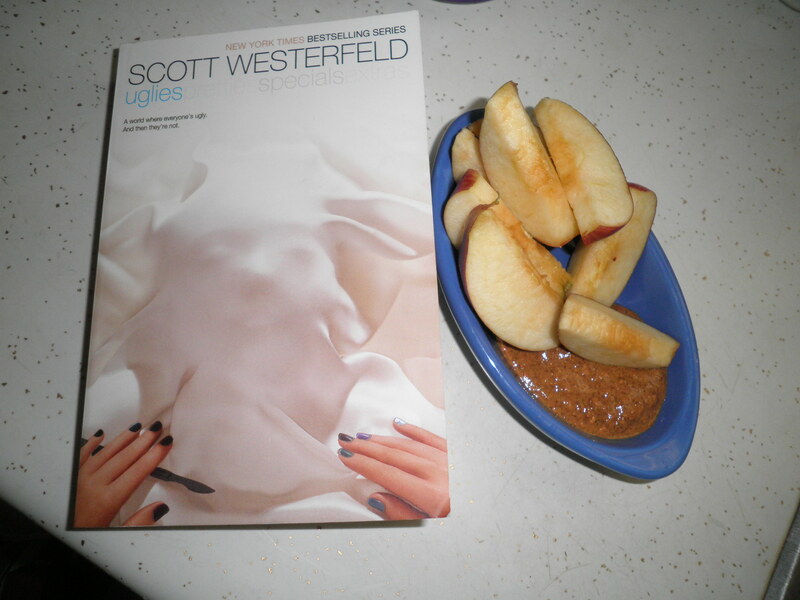 An apple with almond butter while I was finishing up Uglies by Scott Westerfeld. I enjoyed this. I mentioned earlier in the week that my friend Kristen is getting me into Young Adult fiction. This didn’t grab me the same way The Hunger Games did, but I certainly want to continue with the story and find out where the writer takes us. I like it when I find something like this that grabs my attention. I liked it better than I’m making it sound! I’ve just started Pigs In Heaven by Barbara Kingsolver. Return of veggies and the Big Purple Bowl! After a trip to the produce market, I’m stocked up, but I’ve been eating so many, I may need to make another trip there over the weekend! Homemade dressing…I really need to start writing the dressings down so I know what I’m putting in them! 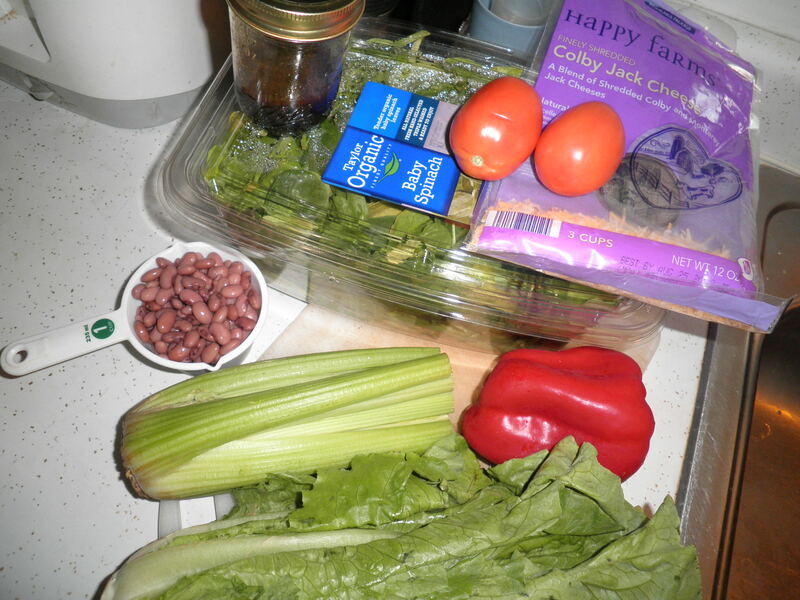 Spinach, romaine, red pepper, celery (need my crunch!) tomato and shredded cheese. Also “small red beans” cooked in the crock pot. My first time making these and I like them! They’re not like kidney beans, which I don’t like. 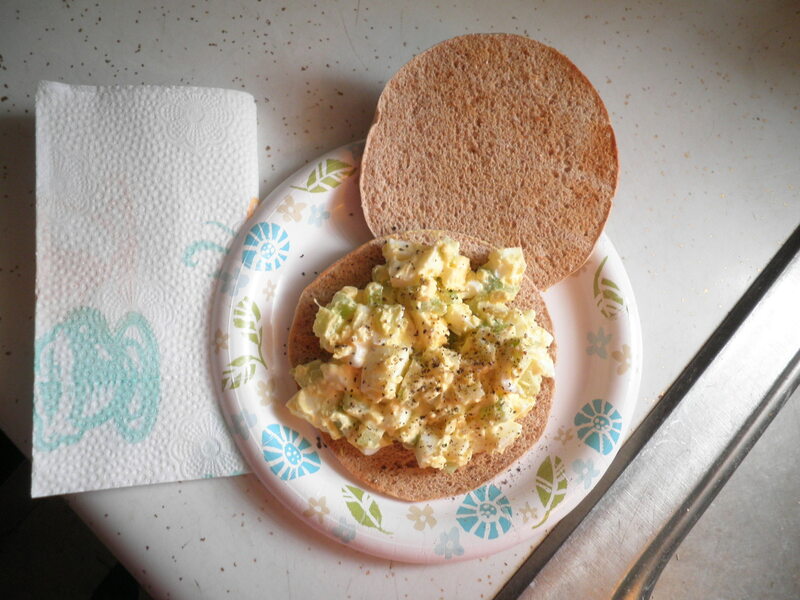 Lunch was some home-made egg salad on a sandwich thin! With lots of celery, not much reduced calorie mayo and lots of ground black pepper. This is so good, I’m always happy when I remember to make this. It’s great because it’s something that both Ralph and I can eat. On the subject of sandwich things. The ones that I get at Walmart are $2.68 and only count for 2 Points on WW. I just found them at Aldi for $1.99. They count for 3 Points, but for that big a saving, I can work within my Points! 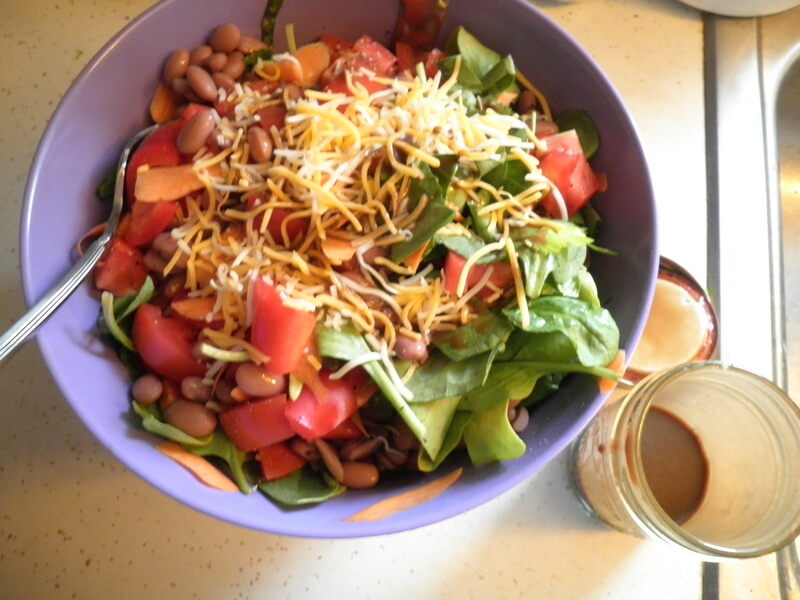 Same basic salad, but in natural light!! Funny how although the ingredients are basically the same, they taste different. I’ll never figure it out. Maybe that’s why I never tire of them. Maybe it’s all in my head…or my stomach!! Regardless, it’s time for me to get less Random and more Specific. So I’d better get out of here in order to accomplish that! Happy Thursday!! It’s Trash Day!! Let’s get rid of some of this STUFF!! This entry was posted in Uncategorized and tagged Big Purple Bowl, The Human Randomizer, Weight Watchers. Bookmark the permalink. oh, i love your take on the randomizer, fran! honestly, that is the main reason to hold giveaways, just for an excuse to use that online number generator – it is FUN! 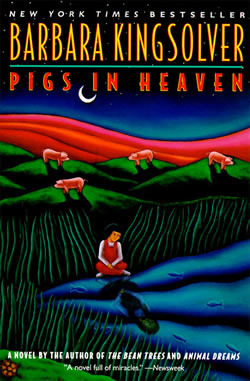 re reading: i did read pigs in heaven and liked it, can’t remember much more than that as it was years ago. i, too, started poisonwood bible and gave up! good for you for getting back on track with your points. make use of that big purple bowl every day, right?! Cathy, it makes me feel so much better when someone else give up on the same books I do! I think sometimes that my book tendencies are so weird. Glad we’re on the same page with that. Pigs in Heaven is good so far! I’m glad I’m inspiring you to eat the good things rather than the ice cream I get talked into so often this time of year!! Allie I’m intrigued by steampunk…I’m going to have to look that up! Sadly, one of the books was Jane Eyre. I just couldn’t get into the older language. I read it years ago in school of course and just wanted a refresher. I feel bad about it, but just couldn’t do it. It wasn’t bad, just not for me at the moment. The other was Untied by Meredith Baxter. Not well written and too much “my mother didn’t love me.” And I was only a few pages in! I’m doing better with Pigs in Heaven, I like it so far! I feel better now, Allie. I know I read it way back when, but just couldn’t do it this time. I keep trolling the Goodwill and the other thrift stores. i’ll find something! Ameena, I didn’t like or finish The Poisonwood Bible. I read Animal Dreams which I enjoyed and so far Pigs in Heaven is ok. It’s funny how some very popular authors I just don’t like. I think we all have some like that. I ascribe to the tee shirt I saw that said “So many books, So Little time.” That’s why I’ve decided if it doesn’t grab me, I’m not taking the time. I have just too many that I do want to read. Don’t feel that you’re unusual…I’m very particular lately!! That is a good book I read it! Tried to check your blog, but it wasn’t there! I think it is inessattemptedhealthyandhappy.wordpress.com i messed up making it do you know if I can change the name? I tried that and it still wouldn’t work. You should be able to change it, but I’m not sure how. I’ve never read any thing by Kingsolver but just got Animal, Vegetable Miracle in the mail today! I’ve heard nothing but great things about her and am ashamed I’m so late to the party. Hi Christine! I did Animal, Vegetable, Miracle on audio when I was commuting and I enjoyed that. I’m enjoying Pigs in Heaven so far. Childhood food memories can be really intense! My Mom used to crave baked potatoes when she was sick so she always made them for us. Now, that’s what I want too. It’s so strange! You’re right, Stacie, they can be very strong. Baked potatoes are Ok with me anytime. I can see that as a thing when you’re sick, actually. I don’t make them as often as I should. It has me tapping my foot, waiting to read the next one. I was at B&N today. Actually touched the other three books. I had gift cards, but I decided against it. Trying to be thrifty. I should Pay you a fee for reading all of your books!! 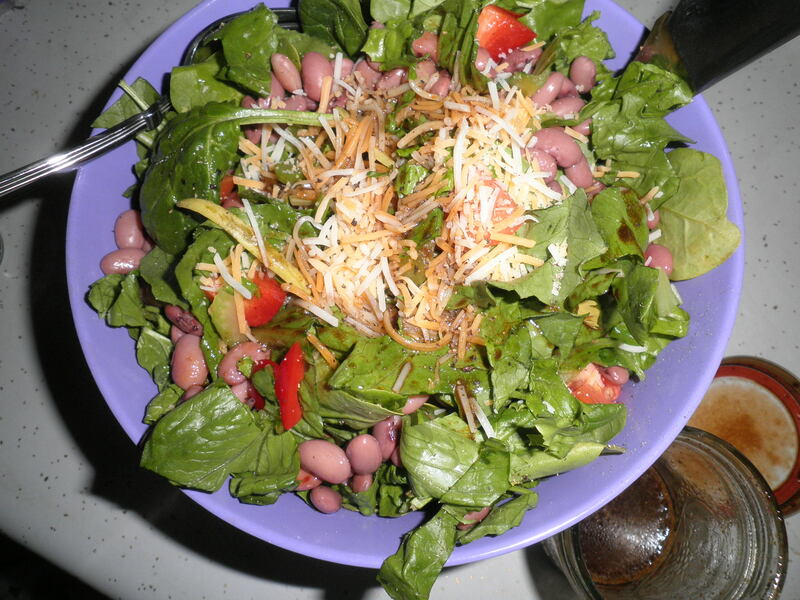 Your salads look amazing Fran! And that egg and pepper sandwich looks yummy too! I love attaching food to old memories, and yours was so cute! How innovative of your mom! I remember that my grandma and I would go to Borders Bookstore cafe every Sunday morning and I’d always order a large cinnamon roll and strawberry smoothie, while trying to tell my grandma to stop bugging the cashier about how fresh the baked goods were :p. I’ve always wanted to try sandwich thins as well! That’s a great memory, Cara!! I like the sandwich thins. They’re great with veggie burgers!